The global debates currently surrounding humanitarian action and its future are being discussed widely in numerous fora and changes are already being felt in many parts of the world: from the localisation agenda to climate change; from counter-terrorism efforts to the growing perception that the world is increasingly more dangerous for aid workers. Humanitarian access is undoubtedly affected by all of these, offering aid workers new challenges to reach those most in need. As we lead up to World Humanitarian Day, EISF takes a closer look at these debates and the impact they will (or already do) have on humanitarian access and the security of aid workers. We should not forget the core role good security risk management can play in supporting access in this changing environment. There is a debate within the humanitarian sector on whether aid work is really more insecure today, as a steady increase in statistics suggests, or whether these statistics are explained by there being more aid workers in more dangerous places than ever before. These debates aside, access to populations in need is not getting easier. From Yemen to Somalia, insecurity poses such a grave threat to aid workers that non-governmental organisations (NGOs) have had to identify different modus operandi, many resorting to remote management to carry out operations in these and other contexts. Humanitarians are committed to helping those most in need but those most in need are usually those hardest to reach. The localisation agenda is heavily embedded within the notion of access. Local staff and local partners tend to have greater access to populations in need, not to mention greater knowledge of the local context and greater local acceptance. Alongside the localisation agenda, however, there has been a lot of talk about risk transfer. Whether this means working through partners or funding local NGOs directly, there is concern that western actors are pushing risk onto locals in some of the most dangerous parts of the world. 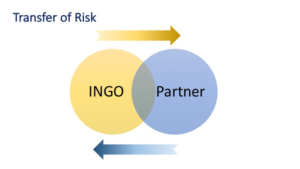 Even if the driving aim of working with local partners is not to mitigate the risk of the international NGO, the very fact of the relationship means that risk is transferred. But are we asking the right questions of the right people? What do local staff / partners / NGOs think of risk transfer? At a recent talk in London, two Syrian fixers spoke about how their work resulted in them having to flee Syria. Unlike foreign correspondents who enjoy a measure of protection due to their foreign passports, local journalists risk not only their own lives but the well-being of their loved ones as well. However, the message from one of the fixers was not one about additional security or the ethics of risk transfer. He asked why, when it was he who was on the ground, risking so much to gather the content, that the name of a foreign correspondent was on the published news story instead of his. If the same holds true within the aid sector, is the humanitarian community projecting a point of view onto local partners and staff, taking away their voice, their agency – disregarding their ability to choose to take on risk? What do local staff think about risk transfer? Do they have the resources/capacity to manage the additional risks? These questions should be asked and good security risk management can help provide a constructive platform from which to discuss these concerns. The localisation agenda needs to seriously consider how international NGOs (INGOs) should support local NGOs: using the wealth of knowledge and resources that INGOs possess in security risk management to ensure local staff and partners are as protected as they can be while carrying out the work that they choose to do. The first step is to have an open and honest discussion with local staff and partners about their take on the localisation agenda, risk transfer and how best to improve their security. The impact that climate change will have on humanitarian work will be myriad but we are starting to feel some of its effects. Climate change has impeded crop production in certain parts of the world already, forcing increasing numbers of farmers to flock to over-populated cities in search of work. This new reality is forcing NGOs to work increasingly in urban settings, with cities exhibiting their own unique characteristics and unfortunate propensity towards overpopulation and crime. In Central America, increasingly erratic rainfall is causing droughts that are pushing farmers to seek employment in urban areas: cities like San Pedro Sula in Honduras, one of the most dangerous cities in the world, where some NGOs’ risk assessments indicate that it is safer for female staff to travel to certain gang-heavy neighbourhoods than male colleagues. In January 2017, El Salvador celebrated, for the first time in two years, a day without a murder in the country. NGOs operating in these contexts are having to adapt their operations to face the severe challenges that arise when operating in these types of dangerous urban settings. Security researcher, Robert Muggah, believes that in the future, warfare, humanitarian action and development work will be concentrated in cities. Rather than speaking about fragile states, he suggests focusing on fragile cities: urban areas in the developing world that are experiencing extremely rapid growth. Fragile cities are characterised by high unemployment rates, overstretched infrastructure, weak governance, and a disproportionately high number of youths. Cities like Mogadishu, where the median age is 16 years. All these characteristics mean that fragile cities exhibit extremely high levels of violence and insecurity, and climate change is contributing to this growing fragility in the developing world’s major cities. If these trends are indicative of the future, NGOs will be operating more in these fragile urban contexts. But is the humanitarian community truly ready to work securely in urban environments? Strong risk assessments, straightforward and simple operating procedures, and a closer look at how to implement an acceptance strategy within urban environments, are all needed to enable aid workers to securely access these new contexts. Good security risk management is key to operating successfully in the fragile cities of our future. Charities have been identified as being vulnerable to terrorist financing under the Financial Action Task Force’s (FATF) recommendation 8. Aid work is sometimes perceived as a potential contributor to terrorist activity via ransom payments, bribes, and access negotiations that, it is argued, bolster a terrorist group’s legitimacy in their area of operation. In response, counter-terrorism efforts from donor countries can hamper NGOs’ ability to access to populations in need in certain regions of the world. Accessing affected populations in south central Somalia, for example, means potentially having to negotiate access with a proscribed terrorist group. Negotiations can contribute to access as well as improve the security of the aid organisation within that area of operation. But while counter-terrorism legislation in donor countries does not make this negotiation unlawful, do organisation understand the nuances? Research has shown organisations tend to err on the side of caution. Counter-terrorism legislation has also resulted in bank de-risking, thereby making it harder for NGOs to transfer funds to high-risk areas. This means searching for alternative ways of getting the money to the ground, which can result in aid workers placing themselves at greater risk by, for example, carrying suitcases of cash across borders. Looking at counter-terrorism efforts through a security risk management lens enables NGOs to take stock of the risks associated with carrying out their work in light of counter-terrorism restrictions. Good security risk management enables NGOs to operate within these new parameters better but also provides a platform from which strong arguments can be made to donor governments to evidence the burden counter-terrorism legislation and its ramifications have placed on NGOs, whether this is by undermining access and/or staff security in given circumstances. Most NGOs recognise that security risk management is essential in order to carry out their work and many NGOs have established dedicated security focal points and set up organisational security risk management frameworks. But the ‘otherness’ of security within humanitarian programming persists. Security can be perceived as an impediment to programming, burdensome, another administrative task. This can be due to a variety of reasons that need to be addressed. But good security risk management is an enabler. Senior managers and humanitarian staff must remember that good security risk management enables humanitarians to prepare for future operational realities within the sector, from localisation to climate change, fragile cities to counter-terrorism legislation. Security risk management plays a crucial role in allowing NGOs to operate effectively and safely in these new operational contexts. It is crucial to support a positive culture of security, which means pushing for a better organisation-wide understanding of how good security risk management can give aid workers the tools to access populations in need, without them becoming martyrs. On World Humanitarian Day, when we commemorate the colleagues we have lost, it is more important than ever to make sure that the security of aid workers is approached as an intrinsic part of programme design and implementation. We are here to do a job and great security risk management helps us get that job done. EISF is planning to carry out a research project on security risk management from the local partner’s perspective. Words of wisdom shared by Loretta Minghella, chief executive of Christian Aid, as part of an upcoming EISF podcast to be launched in September.